With cloud-based data storage, you can access information anywhere and at anytime. Cloud storage eliminates the physical and time barriers associated with being tethered to a single onsite storage medium. With cloud-based data storage, you won’t have to spend valuable time and resources maintaining cumbersome equipment or having a technical support unit on retainer. The ubiquitous and convenient nature of cloud-based PAC systems means that you won’t be restricted to a single system or server. Internal team members and external colleagues and specialists will be able to easily access the same data simultaneously, eliminating any wait time and increasing expediency in communications. 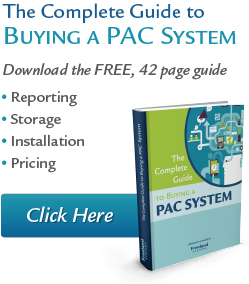 Setting up an on-site system for all your PACS needs could mean substantial upfront costs. But with cloud-based PACS, those costs can be avoided. Most cloud-based PACS vendors offer a range of payment options, including monthly payments, per study payments, and one-time fees. Based on how the system will be used in your office, you have the option of choosing which payment option is most suitable for you. Cloud-based PAC systems make information sharing easy and expeditious. From the cloud and with the appropriate access rights, you can share and receive files from multiple modalities, in any format, and from any interface. Because the cloud model makes your PACS data accessible from anywhere and at any time, you won’t have to worry about creating and implementing a control for disaster recovery and maintenance. If you’re unable to access data on one device or browser, it is an easy fix to simply switch to another device or browser. A cloud-based PAC system does not require physical installation of the software. Implementing an office-wide system switch is as easy as opening a web browser and typing in the location of your cloud storage. Your PACS vendor is responsible for ensuring that all data that is being transmitted and used over the web is encrypted and protected appropriately even if you are using a shared network. Because you no longer have to worry about the security of your PACS and the safety of the information stored therein, you can devote even more of your time to providing the best, comprehensive medical care available.